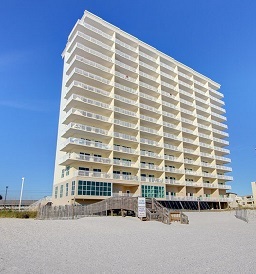 Gulf Shores condominium home for sale at Crystal Shores West. Prime gulf front 2BR/2BA Condo on lower floor at popular crystal shores. Walk in and say sold when you see the gorgeous gulf. Stellar rental with strong history! This view is the perfect level as it feels like you can reach out and touch the sand! Nice wide balcony where you can catch the sea breezes and relax soaking up the views. Super quick access to beach with access just steps away over the boardwalk. Step inside to find updated and turn key beautiful condo decorated in a west indies style with tile through out. One owner condo immaculately maintained. Kitchen features granite, stainless whirlpool appliances, and plenty of cabinet space. Open living and dining area with all windows to let the light and views in. Master facing gulf with king bed and ample room for your ultimate comfort and en suite bathroom with walk in closet. Fall asleep listening to the gentle waves! Second bedroom is spacious and offers en suite bath for a double mini master. Condo comes fully furnished and turn key with storage unit. Crystal shores offers all the amenities you could wish for including indoor and outdoor pool, covered parking, owner's lounge, game room area, sauna, fitness area, BBQ/picnic site and more! Pet friendly for owners. Located close to the heartbeat of gulf shores. Come see this condo and it's sure to be your favorite! Please note unit is occupied and shown by appointment only!